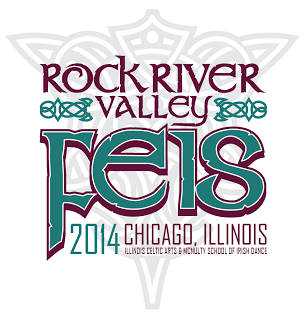 The 2014 Rock River Valley Feis was held on September 6, 2014 at Pheasant Run Resort in St. Charles, IL. This is the 2nd time we have attended this feis, although the venue was different when we attended 2 years ago. The feis was held at the Megacenter right next to the resort. It is a small building with an open ballroom type area. There was a small food court area near the front of the room. Parking was free, plentiful & close – which was a nice change from many other feiseanna we have attended recently! Registration and awards were right inside the entryway, and my dancer was checked in quickly and easily. The feis had 6 stages this year – 4 for grades & 2 for PC/OC. Stages were definitely on the small side, and even dancing 2/time, I saw several collisions due to the tight quarters. Stage quality was a HUGE issue this year. My dancer’s stage saw many slips and falls, including one dancer who had to be helped off the stage & couldn’t put weight on the foot/ankle she injured. I never saw an attempt at mopping or otherwise treating the stage to make things less slippery. I know there were slips/falls on at least one of the PC/OC stages as well. The stages were also FAR too close to each other. With 6 stages playing music all at once within such a small area, it was impossible for dancers to hear their music clearly. Vendors were the usual suspects – George the shoe guy, a t-shirt vendor, 4Irish dancers (who thankfully sold me a card of bobby pins when I realized we had forgotten ours! ), and another hair/bling vendor. Restrooms were plentiful, but were not restocked well, and several dispensers were out of soap for a couple of hours mid- morning. One of the paper towel dispensers had stopped working by lunchtime as well. There was no camping at all whatsoever. Zucas and dress bags were piled all over the place & there was a lot of feis shaming going on in the minimal seating provided. The bottom line is that this venue was simply too small for the entry cap. Either the cap needs to be reduced, or a new venue with more room needs to be secured. My dancer danced 5 times and was seen by 4 judges. That’s very good rotation, in my opinion, especially for a feis that runs by level. My dancers judges also provided detailed & helpful comments, which we appreciate, as that doesn’t always happen. I honestly could not hear the music from my dancer’s stage (and I was not THAT far back). My dancer said she had trouble hearing the music meant for her stage over music coming from other stages & she said most of the judges seemed to be having trouble as well. The feis had a small food court with hot dogs, chips & other similar items. Not much variety or much of anything healthy, but prices seemed relatively reasonable. The speed at which results were posted varied throughout the day and by stage. One dancer from our school waited over an hour for results for 2 dances both danced in the morning. My dancer’s results were up much faster, but she danced later in the day, so perhaps whatever issues plagued the tabulation room in the morning were resolved by the afternoon. The feis only placed approximately 30% of the dancers, which is low even for Mid America feiseanna (which typically place around 40%). I personally like to see a little more generous placement, particularly given that entry fees for this feis were higher than fees for other area feiseanna. Especially for younger novice/open dances who can become easily discouraged, to only place 6 dancers in a group of 23 (which works out to only about 25%) just seems a little stingy to me. I’m not one who believes every kid needs to go home with an award of some kind every time, but I think this feis could stand to loosen the purse strings on the awards a little bit. For grades, this feis was run by level, which usually means most people are in & out fairly quickly, but the Rock N Reel (a soft shoe reel special danced to popular music) wreaked havoc on the flow. For some reason, the Rock N Reel was scheduled to start at 9:30 (our prior experience with specials like this is that they typically run at lunch or at the end of the day), which appeared to be when the feis expected Beginner 2 dances to end & novice dances to start. However, stages were not moving at an even pace, and some stages were ready for the RNR before that, and some weren’t ready until well after. Because the RNR was simply grouped by level (& not by age), the fact that it ran at different times on different stages created stage conflicts for many dancers, which then slowed down all the grades stages considerably. Additionally, the music was blasted & overpowered neighboring stages which were still running regular dances, making it virtually impossible for dancers to hear their music. Some stages did stop altogether until the RNR dances were finished, but others continued to move dances through. A consistent decision on how to handle this would have been helpful. My dancer was one with a stage conflict due to the RNR & when I asked the volunteers how they would prefer we handle it, all I got was a shrug & a “do whatever you think is best”. I assume they were just as frustrated with the lack of consistency as I was, but a pleasant response would have been nice. There were inconsistencies in how many dancers at a time danced, which made some stages move faster than others, too. On stage 6 I saw dancers dancing 3/time, but on stages 3 & 4, I only ever saw 2/time. 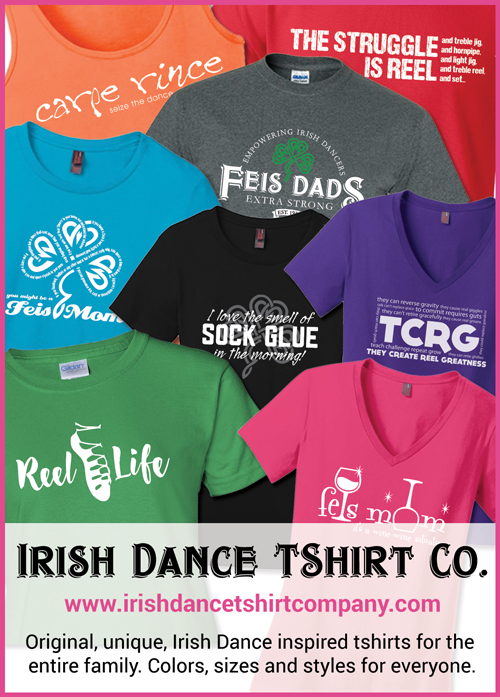 The feis did take only a 10 minute lunch break – they delivered lunch to the judges at the stages & allowed them a few minutes to eat & use the restroom & then things started right back up. This was appreciated by everyone & is something other feiseanna could stand to try. In the past, when my dancer has straddled 2 levels and we’ve attended a feis run by grade, we have typically been in & out in 4 hours. We were there for 8 hours this time, so double what is normal for a feis run in this manner. Sorry Rock River Valley, but the venue & the poor flow made it difficult to do any better than this.